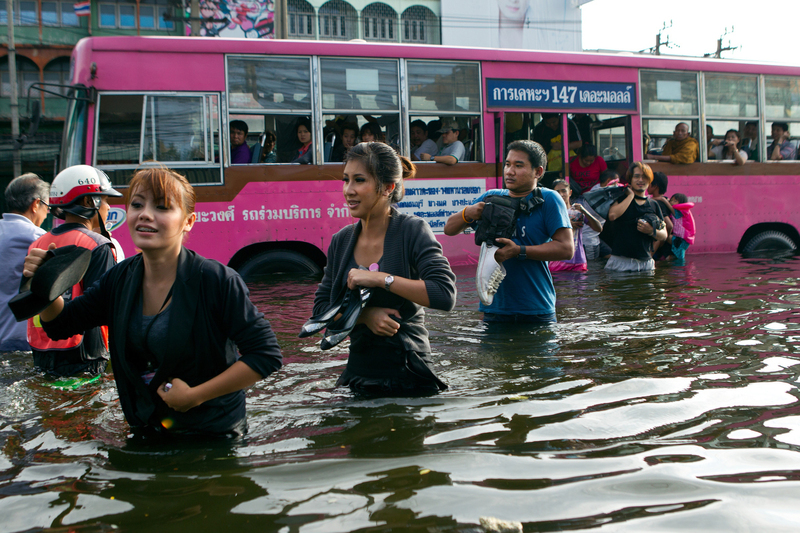 BANGKOK,THAILAND - NOVEMBER 7 : Commuters get off a city bus into waist deep water in the Bang Kae district southwest of the capitol city November 7, 2011 in Bangkok, Thailand. Over seven major industrial parks in Bangkok and, thousands of factories have been closed in the central Thai province of Ayutthaya and Nonthaburi with millions of tons of rice damaged. Across the country, the flooding which is now in its third month has affected 25 of Thailand\'s 64 provinces. Thailand is experiencing the worst flooding in over 50 years which has affected more than nine million people. Over 400 people have died in flood-related incidents since late July according to the Department of Disaster Prevention and Mitigation.